Many years ago, one of my first dogs, Justin, took up the habit of chasing the neighbor’s cattle. 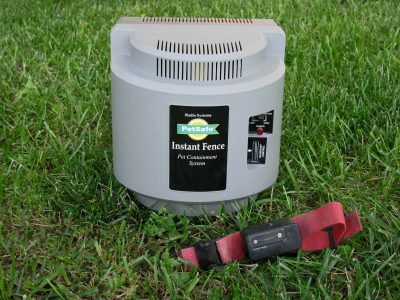 Not wanting to tie him up, but also knowing that no cattle owner likes their cattle chased by dogs, I bought a wireless pet containment system, also known as a wireless fence, to keep him in the yard. Because I have a very large yard and wanted to give Justin plenty of room to roam but make sure he stayed in the boundary, I turned the setting to the highest perimeter it allowed. To make sure the rule of obeying the boundary was clear, I set it to the maximum shock setting. After training Justin how it worked, which he picked up quickly, I let him loose. The fence worked well to keep Justin in the yard while I worked at my previous job outside the home. He learned quickly that the warning beeps letting him know he was close to the edge of his allowed area were to be obeyed, or he would be shocked. I was a big fan of how well the invisible fence worked and even recommended it to other dog owners. I’ll never forget coming home that late afternoon on Christmas Eve to find blood in the snow around the house. Once I pulled into the garage and opened my car door, Justin immediately ran up, sat at my feet, and started whining. That was completely out of character for him, so I knew immediately the blood must be from him. Upon checking, I found he had a large open wound on his thigh. My first thought was that he had somehow gotten hit by a car. Never having had a pet emergency up to that point, I called my vet’s office on the chance that they were still in the office. Luckily, they had a recording on their phone with the contact information for the emergency vet hospital for anything after-hours. Since it was Christmas Eve, I called the emergency hospital just to make sure they were open and once confirmed, we loaded Justin up and off we went. The weather was terrible and it was a long, upsetting trip for me. I cried, blaming myself, thinking I must have let Justin’s batteries in his collar get too low, allowing him to get out of the yard and to the road where he was hit. We arrived safely at the vet hospital where some attendants were quick to bring a gurney out to load Justin on. At that point, I told them I believed, based on the appearance of the injury, that he had been hit by a car. They took him back for testing and treatment and because the weather was getting hazardous, we decided to make the trip back home and wait for the results. The next day, Christmas, I got a call from the vet hospital that Justin’s injury was NOT from being hit by a car, but rather a bullet wound. The bullet had entered under his tail, missed all bones and vital organs, and exited through his thigh, leaving the opening I had seen. He had been lucky. I was furious. Everyone in the area, including the neighbors with cattle KNEW where I worked, and I would and could have dropped everything to get him if I had been notified that he was causing trouble. That was bad enough, but of all days to do it, they did it on Christmas Eve?! And this happened while he was wearing a bright red collar with a transmitter on it, indicating he had some sort of training mechanism on him. Fortunately, Justin recovered just fine and aside from it costing $1,000 to get him patched up, life resumed, except for one big change. After some testing, we determined that the collar was working fine, Justin had just apparently figured out that if he ran through the invisible barrier and kept going, the shocking would stop and he would be free. The wireless containment system was no longer a dependable option I trusted to use while I was not home. Although I hated the idea of living out in the country with no close neighbors or roads and having to tie a dog up, I just couldn’t bring myself to trust the fence or Justin again. We ended up putting a runner between two trees about 60 ft. apart and Justin got attached to a 30 ft. runner line off that. We built him an oversized 6-dog doghouse complete with a wind barrier and put an oversized dog bed inside of it. Every day when I got home from work, I’d let him run for 2-3 hours before dark and all day on the weekends when I was home to supervise him. While I do like the idea of the wireless containment system, and initially loved it, the system definitely has some flaws. Here are my thoughts on the pros and cons of the wireless containment system for anyone considering it. Overall, the wireless fence was costly to maintain between batteries every month or so and replacement parts. It’s been so long I can’t even remember everything I spent keeping it up and running, but I do know that I did and now because I’ve seen it monumentally fail, I’d be afraid to spend the money to try it again on another dog. If you live near a busy road or need to keep your dog away from livestock, nasty neighbors, or any other potentially hazardous situations, I personally don’t feel it’s worth the gamble unless you are nearby to intervene if something goes wrong. If you are interested in reading more about it, here’s the amazon link, https://amzn.to/2K2xZ7i. I’m not sure if the technology has changed much or at all since I bought mine, but by comparing my unit pictured above to the one listed, it doesn’t appear the outside housing has. Reading through the reviews, it seems to be one of those things that people either love or hate. I loved it up until it failed and although I don’t hate it per se like I would have if my dog had ended up dead, I definitely feel like it should be used with caution. The fact that it is not 100% foolproof should be taken into account before you fully entrust it to keep your dog safe. Another con is that a wild animal can get into your yard from the lack of fence, and your dog can’t get away.